Aruba Beach Resort boasts a superb Broadbeach location surrounded by lush tropical gardens and offer Studios and 1, 2 and 3 bedroom apartments. Excellent location, it is within minutes walk to patrolled beach, shopping centres, Broadbeach Mall, restaurants, light-rail to The Star Casino and Pacific Fair shopping centre. Spend your days visiting the hundreds of attractions that the Gold Coast has to offer. 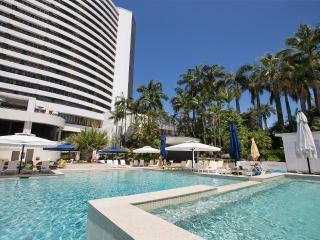 Bel Air on Broadbeach is home to luxuriously appointed 1 & 2 bedroom, fully self-contained apartments. Bel Air on Broadbeach offers a unique holiday experience with a number of the Gold Coast's iconic attractions right on your doorstep. This Gold Coast resort is directly opposite Pacific Fair shopping centre & cinema complex, diagonally opposite The Star Gold Coast Casino and the Gold Coast Convention Centre and just 200 metres from the magnificent surf beach. Popular low rise resort set in expansive tropical gardens with all apartments surrounding a magnificent pool and garden area. Cascading waterfalls and peaceful atmosphere whilst being within easy walking distance to Pacific Fair Shopping Centre, the Casino and the beach, make BreakFree Diamond Beach a favourite. Broadbeach Savannah provides high quality accommodation at affordable prices. This Broadbeach accommodation is conveniently located within walking distance to beaches, Shopping Centres and Convention centre. You will be surprised by the additional facilities offered by the Broadbeach Savannah, including on-site cafe for breakfast. Families are well catered for with 1 or 2 Bedroom Apartments as well as the children's pool. All you need is at your fingertips staying at the Broadbeach Savannah. Mantra Broadbeach on the Park is located just a short walk to Pacific Fair Shopping Centre and one block to the patrolled surf beaches. 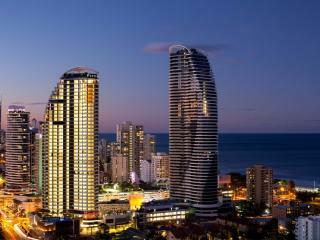 The restaurants, cafes and shopping of Broadbeach are right at the door. The resort offers guests a variety of spacious modern 1, 2 and 3 bedroom air-conditioned apartments. Mantra Sierra Grand is ideally located in Broadbeach, a short stroll from the sandy beaches, restaurants, cafes and boutique shopping. Offering guests 1, 2 and 3 bedroom fully self contained apartments with views of the ocean or Gold Coast hinterland. The resort offers fantastic facilities including an exclusive theatre, indoor and outdoor swimming pools, poolside bbq area and an all weather tennis court. Peppers Broadbeach is the place to spoil yourself with spacious 1, 2 and 3 bedroom apartments offering you the indulgence you deserve. Located in Broadbeach, you have the convenience of being a short stroll to the beach, restaurants and shops. The latest technology including complimentary use of an iPad, and the harmony of the Zen garden and Tai Chi lawns will make your stay a truly unique experience. Situated in the very heart of cosmopolitan Broadbeach and just 100 metres from the pristine patrolled Gold Coast beaches, Phoenician Resort, Broadbeach offers guests a choice modern and spacious 1 and 2 bedroom self contained apartments set amongst lush tropical gardens and pools. Facilities include a day spa, indoor and outdoor pools, gym and BBQ area. RACV Royal Pines Resort is just 10 minutes drive from the beach and is a fully integrated resort. 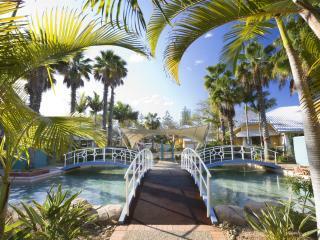 Set on 500 acres, it is located in the centre of Australia's holiday playground - the Gold Coast. The resort boasts a 27 hole championship golf course, tennis courts, day spa, gymnasium, outdoor swimming pool with spa & wading pool, kid's playground and various restaurants and bars. Sofitel Gold Coast Broadbeach is ideally located in one of the Gold Coast's most cosmopolitan location, only 50 metres from the beach and a short stroll to the Gold Coast Convention Centre. Situated on Broadbeach Island, just a short stroll from the beach. The Star Grand at The Star Gold Coast boasts a range of facilities including fitness centre, a stunning new swimming pool, sauna, spa, and jogging track. The superbly appointed guest rooms all feature magnificent hinterland or ocean views from the balconies. Guests can dine in one of the many restaurants or have a drink in one of the bars and enjoy the excitement of the casino. ULTIQA Beach Haven at Broadbeach is ideally located on the beachfront with most of it's 2 and 3 bedroom fully self contained apartments offering spectacular views over the beach and Pacific Ocean. This Gold Coast accommodation is ideally suited to families. Ultra Brodbeach is one block from the beach and offers 1, 2 & 3 bedroom self contained apartments some with ocean views and others with hinterland and city skyline views. The resort features superior facilities including a heated lap pool, tennis court and theatrette.